กระดาษทดสอบ Reducing agents, SO2, (Potassium iodate starch paper) | Higher Enterprises Co.,Ltd. 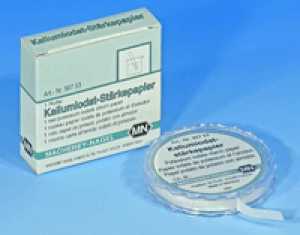 Sulphurous acid or sulphites reduce potassium iodate to free iodine. With starch, iodine gives a characteristic blue-black color. For a detection of sulphite with high sensitivity we recommend Sulfit Test paper (REF 90763).